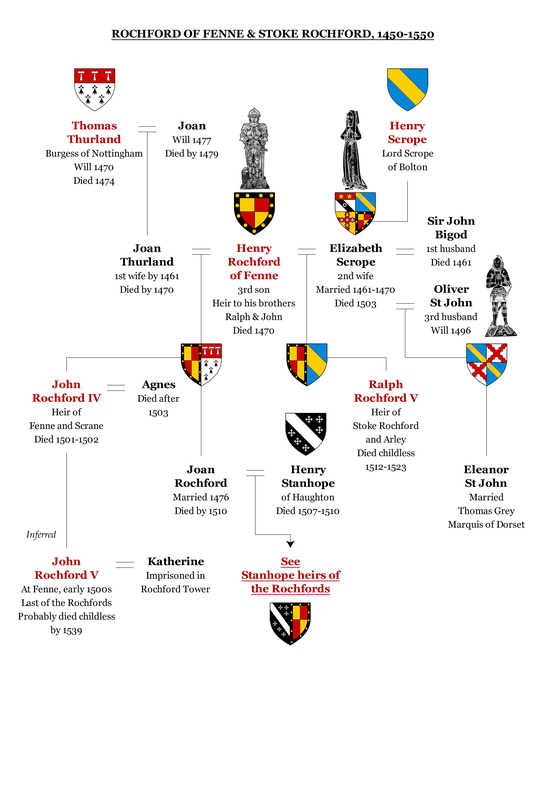 Neither Ralph nor John Rochford was married or had any children, so in November 1444 Henry, the youngest of the three brothers and the only surviving son of Sir Ralph Rochford III, became the sole heir to the family inheritance. Henry was probably still under age at this time, since he does not appear on record for almost a decade. This dramatic change in circumstances created challenges for Sir Ralph’s executors. In September and November 1449 Margaret gave legal undertakings to John Tamworth, William Stanlowe, John Langholme and Richard Leek that she would release “all actions and demands by reason of goods, chattels or debts to her due by his will or by law or custom of the land or church of England”. This is curious: Ralph had been absolutely clear that his will was to be followed. Perhaps there was some conflict between his intent and the legal detail that was best worked out in this way. By this time Margaret was too sick to attend court at Westminster, so she swore her oath before a local justice in Boston. Nevertheless, she was still alive three years later, in January 1453, by which time her two late sons’ executor Sir Robert Wingfield had died too – Margaret herself was now acting as their executor. She again provided undertakings to her late husband’s executors to release them from all actions and demands, this time “by reason of the wills of the said Ralph, Ralph and John”, from her home at Fenne. A few months later, in August 1453, Henry Rochford appeared in court for the first time to waive his rights in the same way. Presumably he was now of age, so he was probably born some time between 1421 and 1433. The purpose of all this legal to-ing and fro-ing is not at all clear, but Henry would certainly inherit all the family estates. Later records suggest these were probably in the region of about 5000 acres of land, 70 houses and £15 annual rental income, centred on the manors of Fenne, Scrane, Stoke Rochford and Arley. Plus there was still the £40 coming in yearly from New College at Oxford. Henry was a very wealthy young man, probably far wealthier than his father had been at the same age. But he was not at all like his father and his ancestors. Henry did not become a knight, he never served on a royal commission, he did not join the Boston Guild of Corpus Christi, and he hardly ever got involved in property deals. Henry was called “esquire”, but this was purely a matter of social status, he being the heir of a great knight, rather than a job role. Things had changed a lot since his father was a young man earning 7½d a day as an esquire in the service of Henry Bolingbroke: the term was now used as a courtesy title for men of any age who ranked well above the emerging class of gentlemen, but had not been knighted. Henry clearly did not need to work for 7½d a day. He had so much money rolling in, he probably did not need to do anything at all other than manage his estates wisely. Of course, great wealth did not stop other young heirs jostling for favour at court, taking up causes and seeking ever greater opportunity. But Henry seems to have had no interest whatsoever in politics, business, law or court life. Consequently, there are very few records of him. Perhaps it was for the better, as the situation for England’s lords and knights was about to take a sharp turn for the worse. All that had been won in France under Henry V was now lost, as was Aquitaine, which had belonged to the English kings since the 1100s. Henry VI was suffering severe mental illness and incapable of rule. In 1455 a brutal civil war exploded between the rival houses of Lancaster and York. This was the War of the Roses. The next thirty years would see the throne change hands six times. Tens of thousands were killed. Bitter rivalries divided families, and few who had land and influence escaped the bloodshed. Rochford Tower in Fenne, built by Henry Rochford around 1460. In this picture of about 1818 the rest of the manor house can still be seen to the right, but only the tower itself is still standing today. 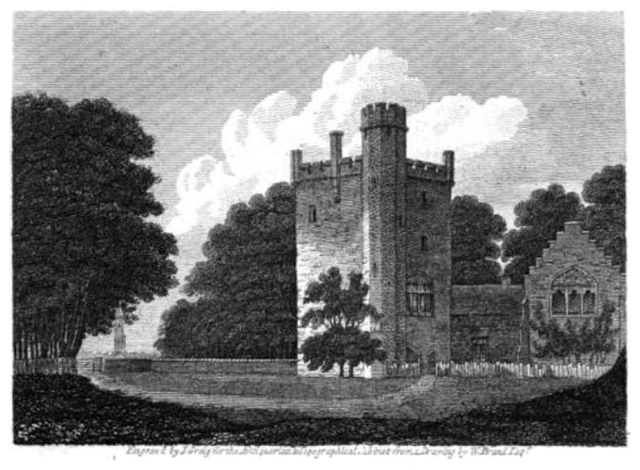 Etching from The Antiquarian and Topographical Cabinet, volume 5. So Henry spent his riches developing a fortified bolthole at Fenne. It was he who, around 1460, built the four-story Rochford Tower there with embattled parapets, turrets and an octagonal staircase. There were huge fireplaces, great paintings on the walls, and a long hall block on the side that probably served as a sort of service wing. It is in a similar style, but on a smaller scale, to Tattershall Castle, which had been built a few decades earlier by Ralph, Lord Cromwell, the supervisor to Henry’s father’s will. Cromwell had probably been influential in Henry’s childhood, and it may well be that the young heir grew up in his household at Tattershall. Henry’s tower seems to have been his principal home, as he was always described as “Henry Rochefort of Fenn next Boston” in the few records of him. Two of these involve him as a trustee to property in Bag Enderby and Stainsby in Lincolnshire; his possible relative John Langholme of Conisholme was involved in these too. Henry’s first marriage, by 1461, was to Joan (or Jane) Thurland, a daughter of the fabulously wealthy Nottingham merchant, mayor and MP Thomas Thurland and his wife Joan (or Jane – the names were used interchangeably). There is an undated charter attached to an ancient copy of Sir Ralph Rochford III’s will in the archives of Westminster Abbey. This records a settlement of “Fenne Manor in Boston, Toft, Skirbek, Freston, Boterwyk and Benyngton” on “Henry Rochefort, esquire, and Joan daughter of Thomas Thurland of Notyngham” and their children. If they did not have any children, the property was to pass to her father and a group of other trustees “to carry out the will of the said Henry”. This settlement of Henry’s property was probably part of their marriage agreement. In August 1464, meanwhile, Henry himself became a trustee to several of Thomas Thurland’s own properties. In the event, Joan did die before her father, but not before she and Henry had a son John and a daughter named Joan after herself and her mother. In his will, written on 16 January 1470, Thomas Thurland left gifts of £20 each “to John Rochefort, son of Johane my daughter, late the wyff of Herry Rochfort sqyer” and “to Johane the doughtir of the said Johane”. After his first wife died Henry married again, this time to Elizabeth Scrope, a daughter of Henry, Lord Scrope of Bolton. For a man who wanted to avoid trouble, this was a shrewd move in more ways than one. By this time the Yorkists’ contender for the throne, Edward IV, was king, and Henry VI was under lock and key. This left Henry Rochford in a dangerous position, he being the wealthy son and heir of a prominent Lancastrian who had once been Henry VI’s personal guardian. Elizabeth’s family, on the other hand, were known Yorkists. She was the widow of Sir John Bigod, who had been killed fighting for the Yorkist cause at the bloody battle of Towton on 29 March 1461. By marrying Elizabeth, Henry demonstrated to the new regime that he did not share his father’s allegiances. He also gained family connections to the nobility – something that his predecessors, despite their achievements, had never had. Later events imply that Henry settled his Stoke Rochford and Arley properties on himself and Elizabeth and their heirs, in the same way as he had settled his manor of Fenne on himself and Joan and their heirs a few years earlier. This was highly unusual: it was the first time in the family’s history that inherited property would be divided, rather than passed down to the eldest son intact. Families usually tried to provide for their younger sons by purchasing new land or arranging valuable matches in marriage, rather than breaking up inherited estates. But since Henry already had a son, he had to put something valuable on the table if he was to secure a second marriage to the daughter of a noble family. Stoke and Arley were it. Henry and Elizabeth seem to have made Stoke, rather than Fenne, their primary home. Her family had property in the neighbouring hamlet of Easton, which shared Stoke Rochford’s church, and it was in this church that they would both be buried. The couple had a son, Ralph, before Henry died on 22 October 1470. It is not known what he died of. He was young – somewhere between 33 and 49 years old – and it is interesting to note that neither Henry, nor any of his children, grandchildren, nor great-grandchildren would live into their 60s and 70s as his predecessors of the last four generations had done. Henry’s brass is elaborate – far more elaborate and knightly than anything his ancestors are known to have had, except for his great-uncle Sir Ralph de Rochford of Walpole. Recently it was in the church’s chancery, the area around the alter, but when Gervase Holles visited around 1640 it seems to have been in or near the north chapel, attached to a large black slab of marble. There is no surviving will by Henry, but he would certainly have left money to the church, and this chapel seems to have been built by or in memory of him around this time. It is directly opposite – but again more lavish than – the chapel built in memory of his father, Ralph, just over twenty years earlier. The north chapel at Stoke Rochford church, built by, or in memory of, Henry Rochford of Fenne, who died on 22 October 1470. 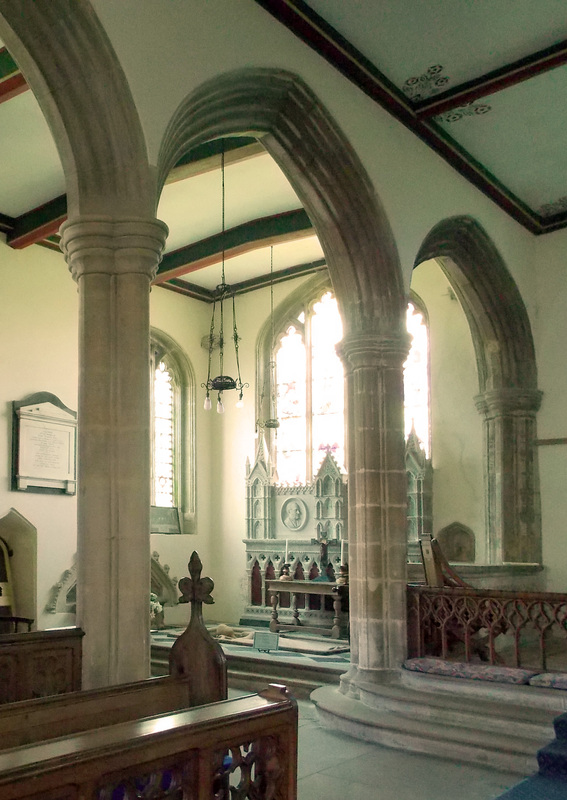 The large east window in the centre of this photo once had the arms of the Rochfords and Scropes in it. Photo by Acabashi, Wikimedia Commons (CC-BY-SA-4.0). The huge east window of Henry’s chapel had two coats of arms in it. One was the arms of the Rochfords and the Limesys quartered, in memory of the family inheritance. The other was the arms of the Rochfords and the Scropes impaled, in memory of Henry and Elizabeth’s marriage. There were several crests, and nearby windows had the arms of the Rochfords and the Scropes again, and also the Rochfords and the Thurlands in memory of Henry’s first wife, Joan. Her family’s arms were a field of ermine with a red band across the top with three silver, T-shaped crosses on it: Ermine, on a chief gules three crosses tau argent. It was a play on the family name. Elizabeth actually lived on for many years, until 1503. She remarried Oliver St John, an uncle of Henry Tudor, who became King Henry VII after his victory at the battle of Bosworth on 22 August 1485. Elizabeth and St John seem to have made Stoke Rochford their home, occupying the manor Henry had settled on her on their marriage. Coats of arms in various windows of Stoke Rochford church, recorded by Gervase Holles in the 1640s. The four coats in the north chapel and the north windows represent Henry Rochford and his two wives, Joan Thurland and Elizabeth Scrope. Those in the north windows of the nave are also connected with the family, but in some cases it is not clear how.